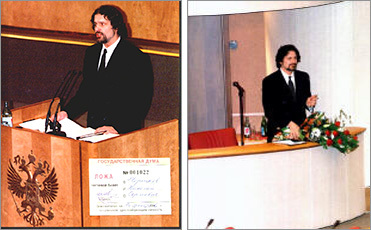 Nicolai S. Tchertkoff, the first foreigner ever invited to address the Russian Parliament on December 20, 1996, presents the Cultural Project of the Tchertkoff Foundation. The Tchertkoff Memorial & Cultural Foundation, a humanitarian non-profit organization, was founded in 1993 to preserve the legacies which the Tchertkoff family left to Russia during the 18th and 19th centuries. A two-year search lead to the discoveries that make up the following pages. The original goal of the Foundation was to restore the family mansion, a 350-year-old historical landmark in the heart of Moscow that was the site of ROSSIKA, a 50,000 book collection which comprised the First Public Library of Moscow, also in need of immediate attention. Since its inception, the Foundation has taken on other ambitious projects in the cities and towns in which the family had influence. In the Voronezh region, there are plans for restoration of a cathedral built in 1878 by Feodor Tchertkoff as well as the reorganization of a sugar factory in the town of Olkhovatka. Future work will take place in the town of Chertkovo, approximately 250 miles south of Voronezh, to meet the cultural needs of its people. These projects are indeed very challenging and without the moral and financial assistance of private and public organizations or individuals, none of these undertakings will come to fruition. Becoming a member of the Foundation will ensure not only that these and future goals will be accomplished but also that each contributor will be recognized as having taken part in the new “Russian Renaissance”! One of the guiding principles of the Foundation is that each goal accomplished must benefit future generations. A strong and independent Russia will ensure stability and trust between peoples of the world.